Hello :) I'm so excited to tell you guys all about this giveaway. The blog has been doing incredibly well and the number of readers is growing by the day! 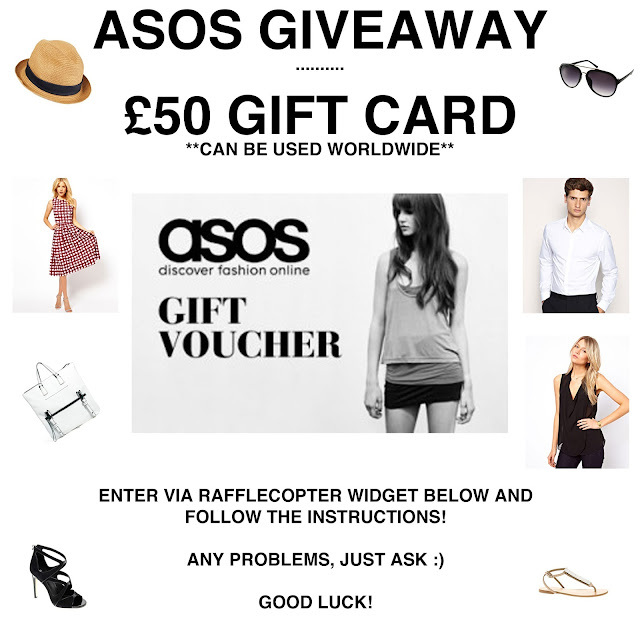 To say a huge thank you, I am giving one of you the opportunity to win a £50 gift card for ASOS. Readers worldwide can enter using the widget below and all you have to do is follow the instructions - its easy peasy. You will earn a number of entries (10 or 5) per completed instruction. The more you complete, the more options you will unlock to earn more entries in the raffle. I have already checked with ASOS and as long as they ship to your destination you will be able to use the gift card! !